Leading auction house Christie’s and H. Moser & Cie. are joining forces in support of the Swiss watchmaking industry. The two companies have entered into a partnership, which will see a piece from the H. Moser & Cie. Swiss Watch collection auctioned once a year. Proceeds from the sale will be donated to the Fondation pour la Culture Horlogère Suisse headed up by Georges-Henri Meylan, Chairman of the Board of MELB Holding. 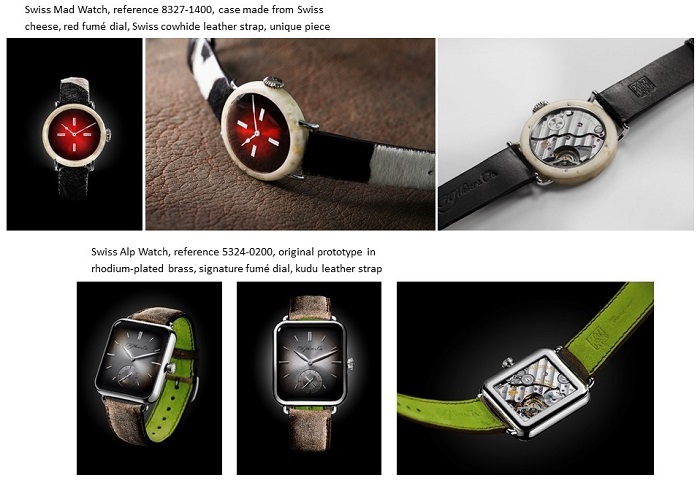 The first prototype of the Swiss Alp Watch, and the unique Swiss Mad Watch, unveiled by H. Moser & Cie. at SIHH 2016 and 2017 respectively, will be put up for auction by Christie’s at its forthcoming May 2017 sale. This collaboration between H. Moser & Cie. and Christie’s is one which places an emphasis on continuity, marking the start of an association between two century-old companies which share an entrepreneurial spirit and a passion for beauty and expertise, which they place at their customers' disposal. The Manufacture has decided to produce a special watch each year, which will be unveiled at SIHH and entrusted to Christie’s to be sold to the highest bidder. The proceeds from the sale will be donated to the Fondation pour la Culture Horlogère Suisse (Foundation for Swiss Watchmaking Culture). This foundation has two objectives: to support apprenticeships in the watchmaking professions and to safeguard expertise in the related artistic crafts. "Preserving our Swiss watchmaking tradition is of crucial importance", explains Georges-Henri Meylan, President of the Foundation. "It is key to the survival of our industry as a whole. We must work together to ensure our considerable expertise is preserved, and growth continues in this, our area of excellence: exceptional mechanical watchmaking". Both the Swiss Mad Watch, produced by H. Moser & Cie. as a heartfelt statement, promoting Switzerland and arguing for a more stringent, revised and revalued Swiss Made label, and the original prototype for the Swiss Alp Watch, made from rhodium-plated brass, inspired by the modern design of smart watches but with a fully mechanical 100% Swiss heart, will be sold by Christie’s in May 2017. "The passion that the Swiss Mad Watch and the ’Make Swiss Made Great Again’ campaign as well as the Swiss Alp Watch and the ’Upgrade to a Mechanical Watch’ campaign have inspired immediately appealed to us", explains Thomas Perazzi, Director of the Watches & Wristwatches Department at Christie’s in Geneva. "The values of tradition and authenticity, and safeguarding master craftsmanship are crucial to us, and we are delighted to join forces with H. Moser & Cie. to bring their message to a wider audience, amplifying it in our own way". Included in the catalogue of rare watches, the Swiss Mad Watch and the Swiss Alp Watch will be displayed in major capitals around the world during the travelling exhibition which precedes the sale. The proceeds made when the hammer falls will go to the Fondation pour la Culture Horlogère Suisse, which will manage the distribution of the funds. Christie’s travelling exhibition of rare watches: Dubai, Bangkok, Hong Kong, Taipei, New York and Geneva. Christie’s, the world’s leading art business, had global auction, private and digital sales in 2016 that totalled £4 billion / $5.4 billion. Christie’s is a name and place that speaks of extraordinary art, unparalleled service and expertise, as well as international glamour. Christie’s offers around 350 auctions annually in over 80 categories, including all areas of fine and decorative arts, jewellery, photographs, collectibles, wine, and more. Prices range from $200 to over $100 million. Christie’s also has a long and successful history conducting private sales for its clients in all categories, with emphasis on Post-War & Contemporary, Impressionist & Modern, Old Masters and Jewellery. Christie’s has a global presence in 46 countries, with 12 salerooms around the world including in London, New York, Paris, Geneva, Milan, Amsterdam, Dubai, Zürich, Hong Kong, Shanghai, and Mumbai.